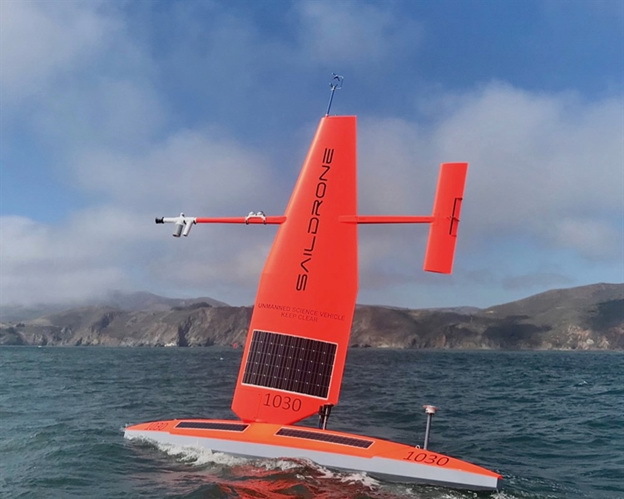 The Saildrone is an autonomous sailing drone currently being explored as a tool to provide high quality oceanic and atmospheric observations (Photo Credit: Saildrone, Inc.). This week, four saildrones departed from Hawaii on the second mission to the equator in an effort to improve the Tropical Pacific Observing System (TPOS). NOAA forecasts a 50-55% chance of a weak El Niño developing during September - November 2018, increasing to 65-70% chance during winter 2018-19. 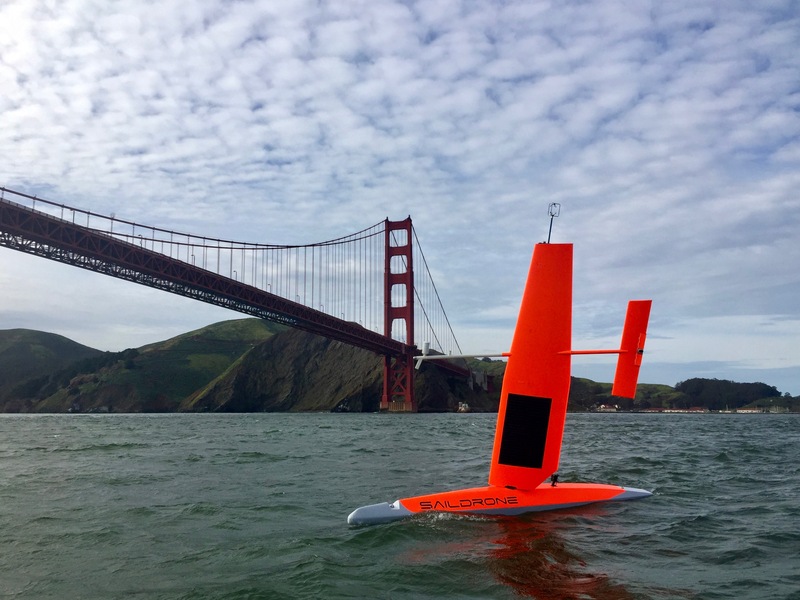 The second saildrone mission will thus capture ocean and atmospheric data during this developing El Niño, including changes in ocean temperature, winds, currents and ocean carbon dioxide concentrations. During the first mission in late 2017-early 2018, La Niña conditions were present. Strong currents and low winds on the equator made navigation challenging. This year, two of the four saildrones have been outfitted with larger, more efficient sails, making them faster and more capable in low wind-strong current environments. This mission is part of a series of saildrone missions to the tropical Pacific, focusing on how this new technology could best be used within the TPOS to improve longterm weather forecasts. PMEL began a partnership with Saildrone, Inc. in 2014 to develop the unmanned surface vehicles for collecting high quality oceanic and atmospheric observations. PMEL's Ocean Climate Stations group has been working together with PMEL engineers and Saildrone, Inc. since 2016 to install sensors on the drones with equivalent or better quality than those currently used on TAO moorings for air-sea flux measurements. Four saildrones ready for deployment in Dutch Harbor, Alaska. to conduct ocean acidification and fisheries research in the Arctic Ocean. Photo credit; Saildrone, Inc.
Over the last week, Saildrone Inc. and NOAA have launched the first batch of saildrones in Alaska and the Washington coast to enhance our understanding of fisheries, ocean acidification and climate science. Four of these saildrones launched from Dutch Harbor, Alaska this past weekend and will make their way northward, surveying more than 20,000 miles through Bering Strait and into the Arctic Ocean to measure atmospheric and surface ocean conditions, carbon dioxide in the ocean, and the abundance of Arctic cod. Arctic cod is a key component of the Arctic marine ecosystem as a food source for seabirds, ringed seals, narwhals, belugas and other fish. These two missions will gather measurements to identify ongoing changes to the Arctic ecosystem and how changes may affect the food-chain as well as large-scale climate and weather systems. Last year was the first time the drones journeyed through the Bering Strait into the Arctic with a newly adapted system to measure carbon dioxide concentrations. Jessica Cross, NOAA Oceanographer at PMEL, continues to use saildrones to study how the Arctic Ocean is absorbing carbon dioxide to help improve weather and climate forecasting and our understanding of ocean acidification in these critical ecosystem areas. These two missions will continue to further demonstrate the operation of these platforms at high-latitudes through the first fully autonomous acoustic fish survey and field tests of an updated carbon dioxide system that was re-designed to address challenges observed during the 2017 mission. NOAA and Saildrone, Inc. are embarking on the fifth year of collaboration and novel data collection using saildrones to better understand how changes in the ocean are affecting weather, climate, fisheries and marine mammals. Engineers and scientists of the 2016 Saildrone Team discussing the first phases of the summer mission in the Bering Sea. Congratulations to all involved with the 2016 Saildrone missions on receiving the Department of Commence Bronze Award and to Susie Snyder for receiving the NOAA Distinguished Career Award. NOAA’s PMEL and Alaska Fisheries Science Center were awarded the Bronze Medal for “strengthening NMSF-OAR collaborations through the pioneering use of a Saildrone for next-generation ecosystem surveys in the Bering Sea”. In 2016, the team successfully conducted the first ecosystem study using two Saildrones. The mission combined both physical and biological oceanography to seek out new ways to supplement traditional vessel-based research. The Saildrones each traveled almost 3,000 nautical miles in the 101 day mission testing innovative technologies, including a specially developed echo sounder and a modified whale acoustic hydrophone. Collectively, the oceanographic, meteorological, and fisheries measurements provided unique and groundbreaking insights to understanding the economically and culturally important ecosystem in the Bering Sea. This was a collaborative mission between the NOAA’s Pacific Marine Environmental Lab, NOAA’s Alaska Fisheries Science Center, UW Joint Institute for the Study of the Atmosphere and Ocean, Saildrone Inc., Simrad AS/Kongsberg Maritime, Greeneridge Sciences Inc, and Wildlife Computers. Read more about the 2016 mission here. The DOC Bronze Award is the highest honor award granted by the Under Secretary of Commerce for Oceans and Atmosphere, which recognizes superior performance characterized by outstanding or significant contributions, which have increased the efficiency and effectiveness of NOAA. Susie Snyder was also awarded The Distinguished Career Award for her “continued efforts in improving budgetary policies and procedures relating to memorandum of agreements and reimbursable funds throughout 30 years of service to NOAA”. This award honors contributions on a sustained basis — a body of work — rather than a single, defined accomplishment. This award also recognizes significant accomplishments across all NOAA program areas and functions that have resulted in long- term benefits to the bureau’s mission and strategic goals. Oculus Coastal Glider being recovered by the crew of the NOAA Ship Oscar Dyson. After 60 days in the Bering Sea, the Oculus Coastal Glider was successfully recovered by crew of the NOAA Ship Oscar Dyson on September 26, 2017. The glider successfully navigated 242.8 nautical miles, completed 3612 dives, and sampled salinity, temperature, dissolved oxygen, sunlight, and fluorescence at a frequency of approximately 3 dives per hour. The glider was tested in a region with a long history of shipboard and mooring observations that provide context for the Oculus glider's observations. Oculus glider measurements reveal detailed information in a known, important biogeographical transition that divides the ecosystems of the northern and southern Bering Sea shelf near St. Matthew Island. Measurements show unexpected ocean mixing in the water column near the island that may be due to internal waves. Data, sensor, and platform analysis is ongoing. Incorporating this higher resolution sampling into the Bering Sea observing network will improve our understanding of how these features affect the ecosystem. The Oculus is a coastal glider engineered to work in the highly stratified, shallow depths of the Arctic. By using a rapid buoyancy system, the glider can change buoyancy states 20 times faster and achieve speeds three times faster than legacy gliders - allowing for a more efficient and adaptive Arctic survey, but transferable to a variety of markets. This was the second field test for the Oculus coastal gliders. The first field test occurred early May 2017, also in the Bering Sea, with 387 dives completed near the M2 mooring site. For the second field test, the glider was deployed from the US Coast Gaurd Cutter Healy during the 2017 Arctic Shield mission. The Oculus was developed at PMEL in partnership with the University of Washington's Joint Institute for the Study of the Atmosphere and Ocean and the University of Washington Seaglider Fabrication Lab. A saildrone as it passes the Golden Gate Bridge in San Francisco, CA. 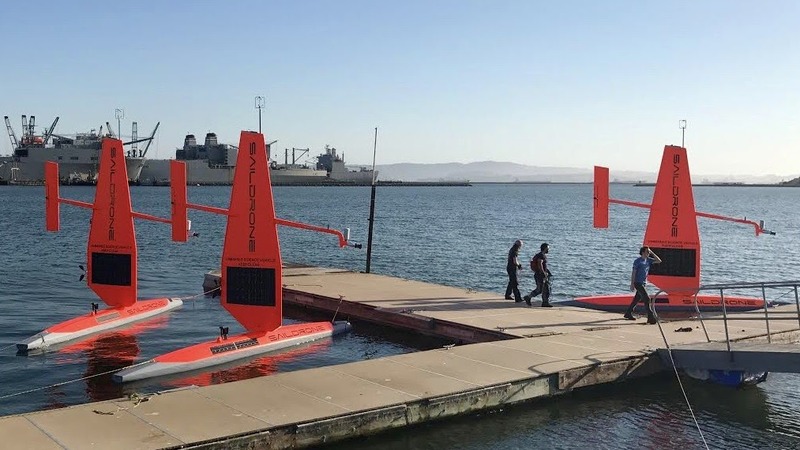 Photo Credit: Saildrone, Inc.
On September 1, two saildrones launched from the Saildrone Inc. dock in Alameda, CA to begin their six-month, 8,000-nautical-mile, round-trip mission to the equator to improve the Tropical Pacific Observing System (TPOS). These saildrones are a component of a broader effort to rethink the Tropical Pacific Observing System (TPOS) that supports sub-seasonal to seasonal forecasting for the US. TPOS provides real-time data used by the US and partner nations to forecast weather and climate, including El Nino. The mission will be testing if this new, enhanced tool can collect a variety of measurements at a quality that matches research ships and proven mooring technology, Tropical Atmosphere Ocean (TAO) array. If this is the case, they may become a powerful tool to provide key observations for weather forecasts. The saildrones are headed to the California Current Ecosystem (CCE) for a short test before taking part in a larger field study with NASA at the NASA SPURS study site in the eastern Tropical Pacific. The saildrones will perform an intercomparison with the Woods Hole Oceanographic Institution’s (WHOI) buoy and collect observational date in the study site. The saildrones will also do a calibration exercise with a research ship to ensure the accuracy and quality of the measurements that are being collected. This is particularly important to scientists when testing new sensors and technologies. Then the saildrones will travel south to the equator to do intercomparisons with the TAO moorings before heading back to Alameda, CA. If the mission is successful, the improved data collection can help improve forecasts for El Nino’s and other weather phenomena that develop in the tropical Pacific and strongly impact North American weather patterns. Read more about the Saildrone missions in the Arctic and the Tropical Pacific here. The fleet of saildrones pictured here are being prepared for a summer and fall of science from the Bering Sea to the Arctic to the far reaches of the tropical Pacific Ocean. Credit: Saildrone Inc.
Over the next four months, NOAA scientists will launch unmanned ocean vehicles, called Saildrones, from the Arctic to the tropical Pacific Ocean to help better understand how changes in the ocean are affecting weather, climate, fisheries and marine mammals. The wind and solar-powered research vehicles that resemble a sailboat will travel thousands of miles across the ocean, reaching some areas never before surveyed with such specialized technology. Earlier this week, PMEL scientists and Saildrone, Inc. sent off three saildrones from Dutch Harbor, Alaska. For the first time, two saildrones will sail north through the Bering Strait into the Arctic Ocean to study how the Arctic Ocean is absorbing carbon dioxide. A third unmanned vehicle will survey more than 3,100 nautical miles in the Bering Sea for walleye pollock, Northern fur seals that prey on them and the elusive North Pacific right whale. This work will build on research conducted during 2016, including a study of fur seal feeding rates. NOAA Fisheries Alaska Fisheries Science Center scientists will also attach video cameras to fur seals to record feeding and verify the species and sizes of fish that fur seals are eating. In September, scientists will launch two more unmanned systems from Alameda, Calif., on a six-month, 8,000-nautical-mile, round-trip mission to the equator to improve the Tropical Pacific Observing System (TPOS). TPOS provides real-time data used by the U.S. and partner nations to forecast weather and climate, including El Nino. The unmanned sailing vehicles will take part in a larger field study with NASA, and visit mooring sites along the array of observing buoys. Read the release on NOAA Research here and follow along with the Innovative Technology for Arctic Exploration's Blog for the Bering and Chukchi Seas missions. May 16-June 2: The second summer field season for the Arctic Heat Open Science Experiment began with its first flight out of Kotzebue, Alaska. The research team, including Kevin Wood, are flying aboard a specially-outfitted NOAA Twin Otter aircraft to launch traditional atmospheric and oceanographic probes as well as the experimental Air-Launched Autonomous Micro-Observer (ALAMO) floats into the Chukchi Sea. After last year's field missions, two ALAMO floats made it through the winter and are currently profiling every 5 days. Check out the raw data for float 9085 and float 9076. Arctic Heat is an open science experiment, publishing data generated by the project to further NOAA Science Missions with real-time data to facilitate timely observations for use in weather and sea-ice forecasts, to make data readily accessible for model and reanalysis assimilation, and to support ongoing research activities across disciplines. Arctic Heat is a joint effort of NOAA Pacific Marine Environmental Laboratory (PMEL) Arctic Research, the Innovative Technology for Arctic Exploration (ITAE) program, the ALAMO development group at the Woods Hole Oceanographic Institution (WHOI), and the Joint Institute for the Study of the Atmosphere and Ocean (JISAO) at the University of Washington. 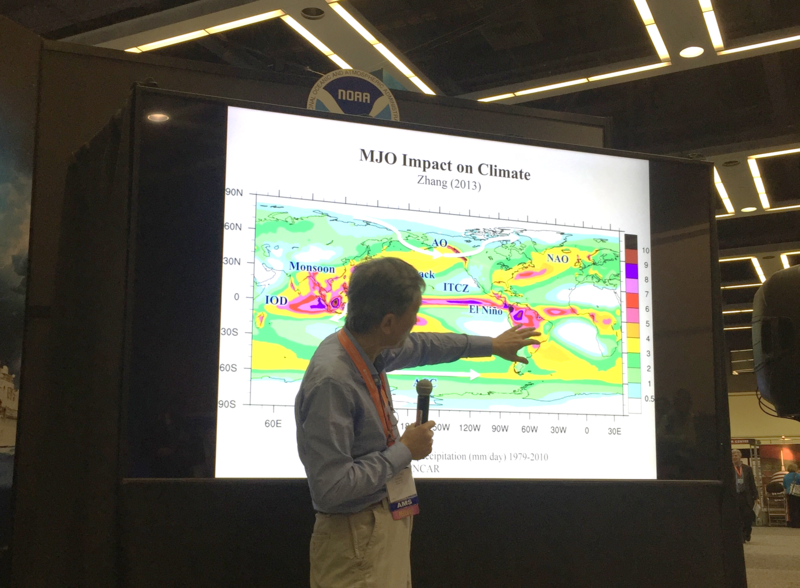 Dr. Chidong Zhang gave a talk at the NOAA Booth during AMS about his research on the Madden Julian Oscillation. Last week, PMEL scientists attended the American Meteorological Society (AMS)’s Annual Meeting in Seattle, WA and the Alaska Marine Science Symposium (AMSS) in Anchorage, AK. Presentations covered research in the Bering Sea, data management and access, El Nino, sea ice, the Earth's energy imbalance, innovative technologies, and recent warming in the Pacific and others. At AMSS, the Ecosystems and Fisheries-Oceanography Coordinated Investigations (EcoFOCI) group had multiple presentations and posters on the Bering Sea including topics on the recent marine heat wave in Alaska, linking annual oceanographic processes to contiguous ecological domains in the pacific Arctic, fish distributions, ecology, Saildrone and oceanography. A wider range of topics were covered at AMS and included invited talks from Nick Bond, Chidong Zhang and Kevin Wood. Dr. Zhang spoke about the Dynamics of the Madden-Julian Oscillation; Kevin Wood presented the Old Weather Project using historical U.S. ship logbooks to collect and analyze historical climate data; and Nick Bond discussed the recent warming in the NE Pacific. 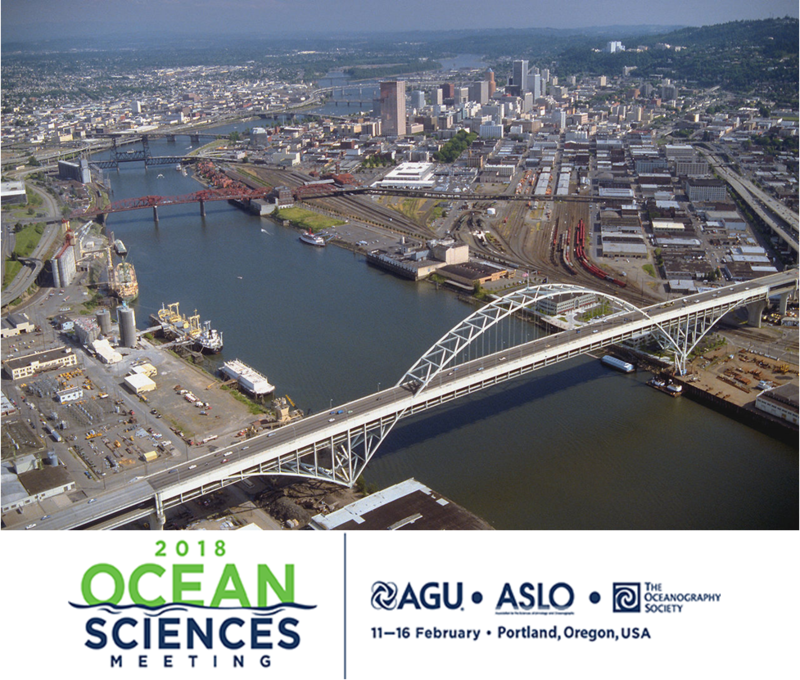 The annual meeting is the world’s largest yearly gathering for the weather, water, and climate community and brings together atmospheric scientists, professionals, students, educators and research’s from around the world. AMS is the nation’s premier scientific and professional organization promoting and disseminating information about the atmospheric, oceanic, hydrologic sciences. Learn more about all our different research themes and groups here. 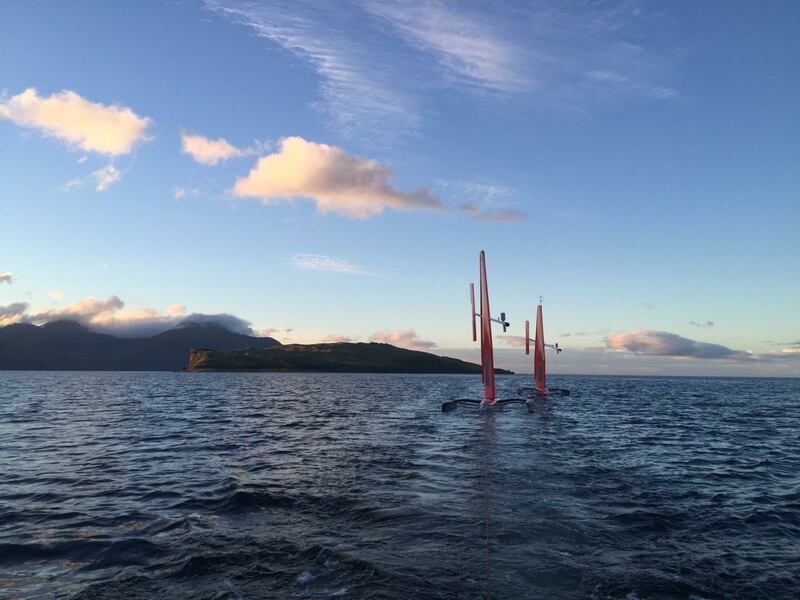 The saildrones as they make their way to Dutch Harbor, AK for recovery. Photo Credit: Saildrone, Inc.
On September 3, after three months of collecting data in the Bering Sea, the two Saildrones have been safely recovered. The Saildrones each traveled almost 3000 nautical miles in 101 days. After arriving in Dutch Harbor, AK, the Saildrones were packed into a container and shipped to their home base in San Francisco, CA. Data from the tested technologies for fish and marine mammal acoustics are expected mid-September with preliminary analysis completed around the New Year. This was a collaborative mission between the Pacific Marine Environmental Lab, Alaska Fisheries Science Center, Saildrone, Inc., Simrad AS/Kongsberg Maritime, Greeneridge Sciences, Inc, and Wildlife Computers. Continue to follow the Saildrone on the Innovative Technology for Arctic Exploration page to learn more about upcoming events and preliminary results in the weeks and months to come.